Co-directors John Musker and Ron Clements are known for some of Disney’s most magical and memorable musicals (The Little Mermaid, Aladdin, The Princess and the Frog) and they’ve found success again with this exceedingly charming and gorgeous new computer-animated film. Moana is an example of the Disney “formula” working at its highest level, pairing original music that’s both clever and catchy with a story that is sophisticated enough to keep adults involved but also moves along at a pitch-perfect pace so as to not throw off any of the youngsters too. Also packed with loads of good natured humor, it’s a breezy and vibrant work sure to put a smile on the face of all who encounter it. 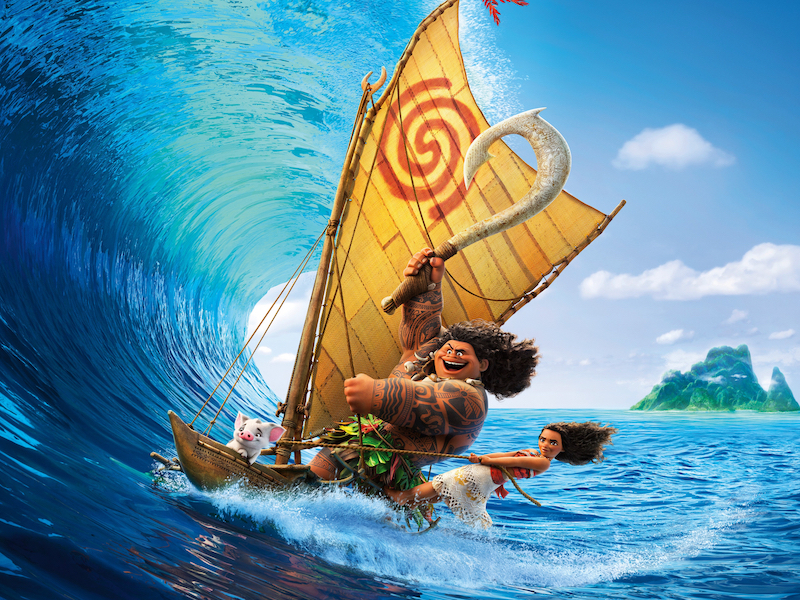 Set on the Polynesian island of Motunui, our heroine Moana (Auli’i Cravalho) is next in line to be chosen as the chief of her village but it seems that the ocean has larger plans in store for her. After receiving an ancient stone that is said to be the heart of a goddess, she learns of the demigod Maui (Dwayne Johnson) and seeks his help in returning the stone to its rightful owner. Moana and Maui’s adventures on the sea pit them against numerous adversaries like the coconut-shaped pirates called the Kakamora and an oversized crab named Tamatoa (Jemaine Clement), who looks like a bedazzled version of Sebastian from The Little Mermaid. It’s no surprise that there’s an unmistakable Flight of the Conchords vibe to the crab’s slippery funk musical number “Shiny” and Dwayne Johnson gets some big laughs out of his equally conceited “You’re Welcome” but it’s not just the humorous songs that stand out. Rich and empowering group numbers like “Where You Are” and “We Know The Way” work as great character introductions and also move the plot along in a satisfying way. But it’s Moana’s signature tune “How Far I’ll Go” that will likely be competing for Best Original Song next Feburary and while it may not have the instant, chart-topping appeal of Frozen‘s “Let It Go”, it’s every bit as heartfelt and compelling. Moana is Musker and Clements’ first CGI film and while the traditional hand-drawn animation of their previous work is no doubt admirable on its own terms, this is by leaps and bounds their best looking movie. The endless dazzling blue ocean, which not only serves as a beautiful backdrop for the action but also becomes a personified character in the story, is captured with the kind of lush precision that may not have been possible even 10 or 15 years ago. Other natural elements of fire and earth are invoked in similarly striking manner, especially in the climactic battle that pits our heroes against a molten monster who hurls fireballs that kindle the night’s sky. What makes this film stand out most against its predecessors, though, is the progressive nature of its narrative, which eschews the tired Disney Princess cycle and instead portrays a female protagonist who isn’t searching for true love or a man to complete her life. This is a heroine who is smart, capable and clearly qualified enough to run her entire village, whose journey is one of self-discovery rather than societal obligation. It’s just one right step in a movie that takes many correct ones and after a year of one box office smash after another, Disney may have saved its best for last with the resounding achievement that is Moana.